The year 2002 was witness to a full mobilisation by the Indian Army post the high profile terrorist attack on the Indian Parliament on 13th Dec 2001. Pakistan Army also mobilised in response. Amidst these tensions the two forces regularly attacked each at the Line of Control (LoC) in Jammu and Kashmir (J&K). Most of these firings were minor skirmishes resulting in no loss of life; indeed artillery and small arms fire had been regular occurrence for several years. However, in one event the Indian Air Force (IAF) was called upon to bombard Pakistani troops. The battle leading to eviction of Pakistani intruders was euphemistically called “Kargil-II” in the popular media [B] owing to the outward similarities of the operation to the Kargil War in 1999. The incident was covered in some detail by Praveen Swami of the “The Hindu” newspaper. According to Swami, Pakistan occupied four sangarhs (improvised bunkers made of stone) and forward trenches that had been built by Indian troops over the years at Loonda Post which is in the Machhal (or Macchil) Sector. Reportedly unexpected whiteout conditions due to rain and fog provided cover to the Pakistani troops. The area was the responsibility of a battalion of the Sikh Light Infantry under the 53 Infantry Brigade. The overall command of the LoC in the area fell with the 15 Corps. Loonda Post has strategic value because it overlooks Kel town in the Neelam Valley on the Pakistani side of the LoC. It is not known how long the Pakistani troops were occupying the feature. “Point 3260 is not considered tactically important and viable for physical occupation by our own troops. Being in close proximity of the Line of Control and the area not being physically occupied, Pakistan troops had intruded into this area. However, since the area is regularly patrolled by our own troops, they observed presence of some Pakistan troops in the area of Point 3260 on July 26, 2002”. 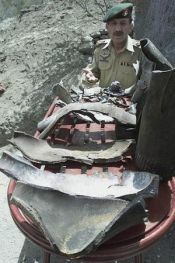 The intrusion was detected on 26th July when a patrol by Sikh LI was ambushed leading to 3 deaths. Per other reports the intrusion was detected by a UAV. The Indian Army responded with 155 mm fire FH-77B ‘Bofors’ howitzers and mortars on the feature from three sides. Mi-17s flew in special forces. In the counter bombardment from Pakistani artillery 11 Indian soldiers belonging to Sikh LI and attached Ladakh Scouts troops lost their lives.  Post the initial clashes the Army raised a request to the IAF for support. 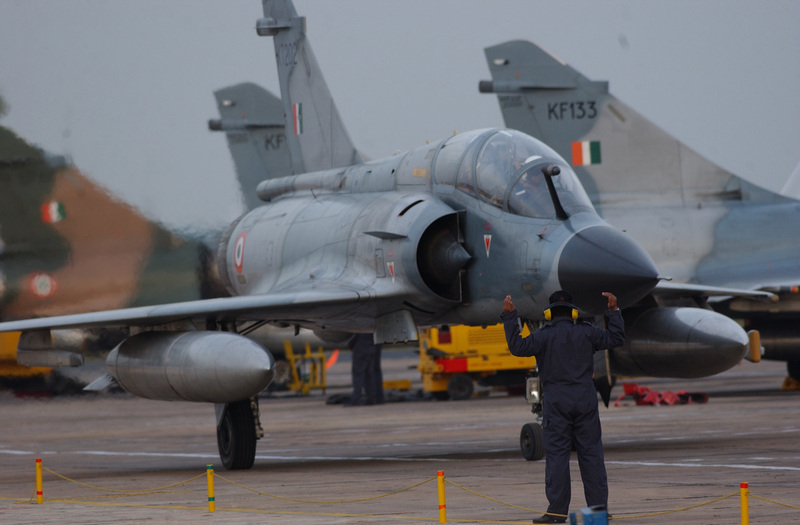 The IAF in turn sought prior approval from the Defence Minister. On 2nd August [C], a multi ship formation of Mirage-2000s from the 7 Sqn “Battleaxes” went airborne with precision guided munitions on board. Time on Target: 1315 hrs. As many as 8-12 Mirage-2000s were involved in the mission, which was led by the CO 7 Squadron - Wg Cdr Rajesh Kumar with four arriving on the target. Wg Cdr Kumar dropped the first 1000 pound bomb followed by other aircraft. The air attack was defended against by SAMs. The Indian Army was able to recapture the post after the attack destroyed Pakistani positions. To recognition of his actions Wg Cdr Rajesh Kumar was awarded the Vayu Sena Medal (Gallantry) in 2003. The CO of the Sikh LI Bn, Colonel V.K. Malhotra was removed from command but was cleared of all charges in the following inquiry. Pakistan losses added to 28 deaths in the operation. In a press conference on 23rd August 2002, PA public relations officer Major General Rashid Quereshi, known for dishonest statements since the Kargil War, alledged that the IAF had attacked forward Pakistani posts in Gultari area in support of the Indian Army on night of 22nd/23rd. It was claimed that the PA had retaliated in defence leading to death of Indian troops. The Indian Army completely denied the whole affair and furnished that no casualties had occurred in that timeframe. The claim coincided with the visit of a senior American diplomat Richard Armitage to Pakistan, and hence is thought to be fabricated and not related to the Loonda post incident. Possibly the bogey was raised to pre-empt any such plans by the Indian armed forces? It is not clear as to why there was no such claim from the Pakistani side during the actual battle in Machal. It can be speculated that since it would mean admission of defeat, Pakistani sources did not reveal it. Secondly, the Pakistani claim would have been untenable given the sanctity the marked LoC boundary enjoys since the Kargil War in international circles. [A] A spate of denials and counter-denials by the Indian Air Force and Army when the story was ‘leaked’ to the public. The confusion continued for months till Defence Minister George Fernandes confirmed the incident in Parliament in November. 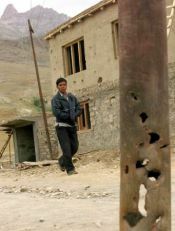 [B] The term 'Kargil-II' is not official; coined by mass media. [C] The date of the air strike was reported to be 29th July by Praveen Swami. “Zones of incursion” by Praveen Swami. Published in Frontline (Volume 19 - Issue 19, September 14 - 27, 2002). Citiation for Vayu Sena Medal (VM) awarded to Wg Cdr Rajesh Kumar. “LoC turns hot again” by Praveen Swami. 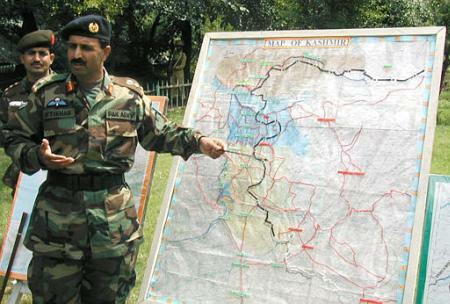 Pakistan military spokesman Major-General Rashid Qureshi points towards a map during a news conference in Islamabad August 23, 2002. Pakistan on Friday accused India of sending troops and its air force to attack a Pakistani mountain outpost in the north of the disputed Kashmir region overnight, in what Islamabad called a "highly irresponsible and escalatory act." Commanding officer Brig. 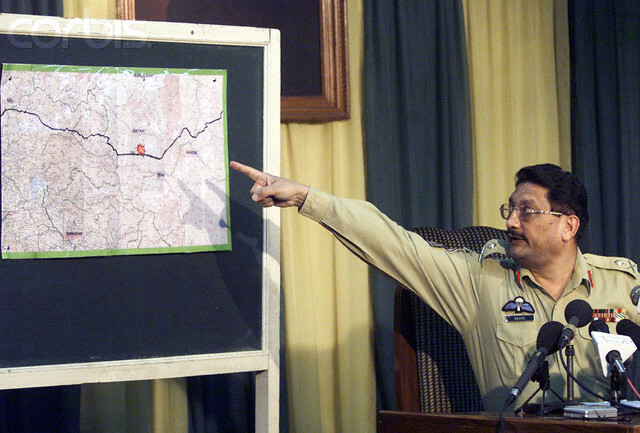 Iftikhar, points out a Pakistan army post on a map along the Line of Control which was attacked by Indian forces during a briefing in Chakoti in Pakistani Kashmir, Saturday, Aug 24, 2002. According to a Pakistani military spokesman India launched a massive attack at a Pakistani post in Kashmir last Thursday. Amid reports of fresh violence in Kashmir, Deputy Secretary of State Richard Armitage said Saturday it was up to Pakistan and India to find a solution to the long-standing crisis over the disputed Kashmir. 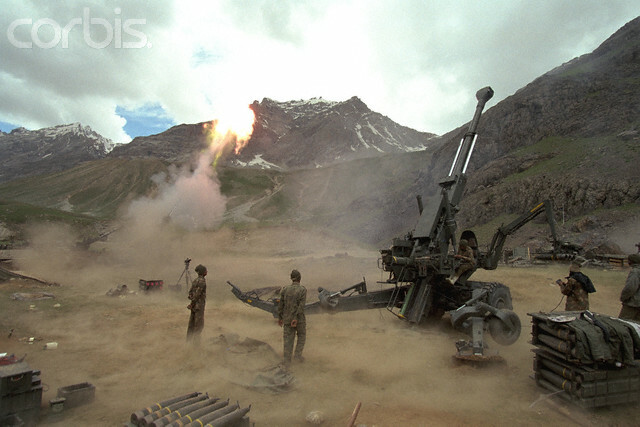 Commanding officer Ayyaz Ahmed shows shrapnels Indian artillery fired across the border on Pakistani post in Gultari at the Line of Control between Pakistan and India, Thursday, Aug 29, 2002. Pakistan and India are constantly exchanging heavy artillery over the Kashmir dispute. A Kashmiri boy walks past a shrapnel hit electric pole damaged due to an artillery shell fired by Pakistani troops in the village of Drass near India-Pakistan border, 150 kms (93 miles) east of Srinagar August 9, 2003. Thousands of people in this region are caught in daily artillery duels between Indian and Pakistani forces despite recent hints of a thaw in relations between the nuclear-armed rivals who have fought two of their three wars over Kashmir. Picture taken August 9, 2003. IAF Mirage-2000TH during Ex Cope India 2004. 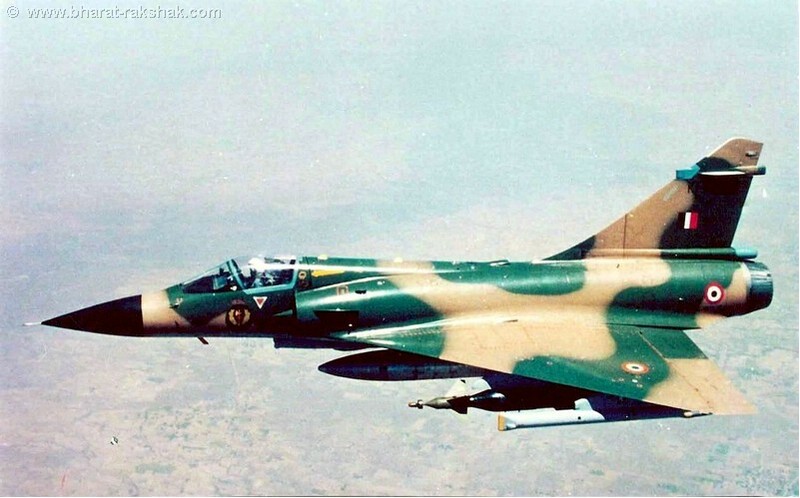 Two seat Mirages were used for bombing missions during Kargil War. 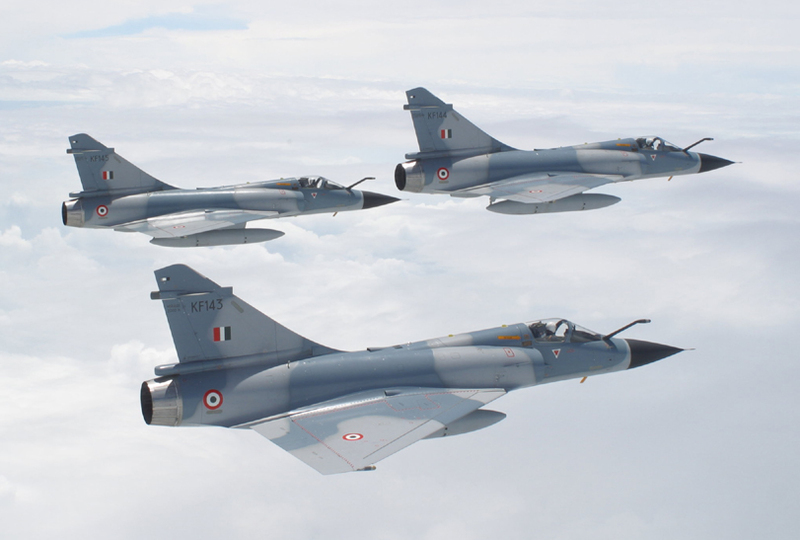 Beautiful formation of Mirage-2000s - among IAF's most advanced aircraft. 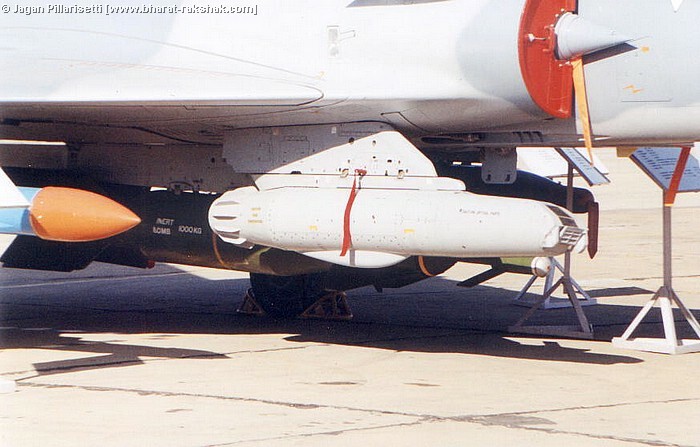 Note the refueling probes which were added after IL-78 tankers were obtained by India. Kargil War : Extract from the book "Despatches from Kargil"